Sailboats today are selling for a tiny fraction of the cost of building one, making them both a great deal, and a terrible one. Great because you can buy yourself a place to live for one month’s salary – and terrible because buying the wrong boat, or buying a boat for the wrong reasons, can be the first step in a long road to financial quagmire. A small percentage of the population actually live aboard sailboats. It’s one of a tiny handful of ways to avoid both paying rent and paying a mortgage. One of the best known full-time liveaboards is fellow blogger Dmitri Orlov anchored in Boston Harbor. 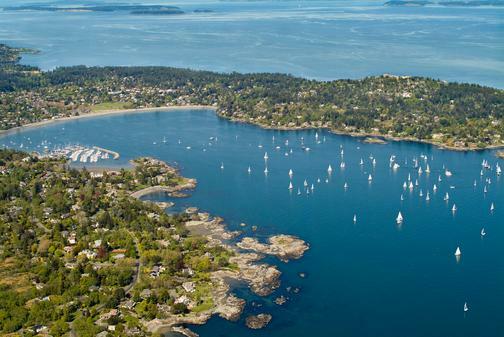 I lived on a 44′ sailboat myself for just over a month in Cadboro Bay, Victoria – an experiment cut short both by bad weather and bad weatherproofing. If the romantic notion of falling asleep rocked by the sea inspires you, you’ll want plenty of buckets along for the adventure. The sea finds even more need for sturdy airtight containers than the land does. While on my own watery adventure, I wrote about catching water for washing dishes, and did not write about the time I had to empty an entire 44 foot bilge 5 gallons at a time when I left the bathroom pump in the “on” position for 2 hours longer than I should have. Jack of All Hobbies over on Squidoo shares the boat anchor he made for his 17 foot skiff. He reports that this basic anchor should only be thought of as a secondary anchor and not a boat’s primary means of being there when you get back. On the other hand, below are the anchors used to moor Betty’s Island, a treed raft built on Buchanan Lake in honor of an artificial lady named Betty. The basic design of a 5 gallon anchor is simple. Eye hooks sunk in concrete, with enough grip that nothing can pull loose. 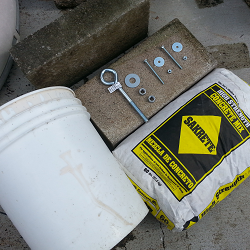 Remember – one bag of concrete makes exactly 5 gallons of concrete. Components for a five gallon anchor will run you around 8$, about half the price of a decent cheap anchor on Amazon. It’s a fun and easy project but won’t save you much more than a couple gallons of gas. I enjoy browsing your site. I’ve been a fan of the 5 gal bucket for decades. I’ve lived on a 32 ft catamaran for 22 years and have found many uses for them. Maybe I’ll be able to contribute something to the site.